Net Entertainment has released a brand new game that is already taking the online market by storm. The new slot machine made its debut on the 9th of this month, and this slot is Wild Words. The new slot has a unique visuals style with five reels that does not have any paylines. The reason behind that is that the slot machine has the Cluster payout format. 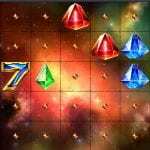 It has a 5×5 grid, and it is available to play on a wide selection of devices and operating system. Therefore, players will be able to enjoy this new slot on their Androids, iPhones, Windows laptops and more. The new slot has a betting range between 0.20 and 400 and a maximum payout of 100,000 credits. It has free spins and a wild icon with a random feature. The slot machine has cartoon-style graphics, symbols, and animations. These graphics come in high quality that will help immerse you into the adventurous theme of the online slot. You will see that the online game takes place in the watchtower of the superhero birdies and you will see them on the left area, on their control panel monitoring the city. As for the reels, they appear on the right side of the screen, where you will see the slot’s symbols and 5×5 grid. The symbols that will be spinning on the reels of the game to form winning clusters include different shaped and colored jewels and gems. Net Entertainment pulled up all stops on this one, with a unique story and theme. The slot machine takes you into an alternative universe where birds are sentinel beings. You are going to go to the watchtower where you will join three superhero birdies that are watching the skies, protecting the city from the monsters that attack it. When that happens, they will travel to one out of three elemental worlds where the only hope is to defeat the beast, so the bird world survives. The developer depicts the story in great graphics and animations that will immerse you into the experience and the birds' adventure. The slot machine has a Return to the Player percentage of 96.47%, which is thanks to the cluster payouts of the slot game, as well as its bonuses and features. For example, whenever you create a winning combo with a hero symbol, all other hero symbols on the reels will turn wild. There is also a random function that can become active at any time. At random, symbols of one random color will remain on the reels, and the rest of the symbols will vanish, and new ones will appear. The main attraction of the slot is the free spins round, which you can trigger when you get 3x scatter icons. You will trigger eight free spins that will take place in one of three worlds. These worlds are the Dark Forst, the Fire Lands, and the Ice World. Each one has its unique characteristics.